CLICK HERE TO GO TO THE NEW BLOG! I have to say I think it's so sweet that I have gotten emails and comments asking where I've been. Well, first I've just been on the down low enjoying time with my family and daughter. We took her to my daughter to see Playhouse Disney last weekend and she was in heaven, Mickey is her favorite!! And I've had my brothers family here and also my parents here twice in the last 3 weeks. So I've had a refreshing break from my computer. I'm still working on what I'd like my pictures to look like for studio work. I do like these but they are still not where I would like them to be. 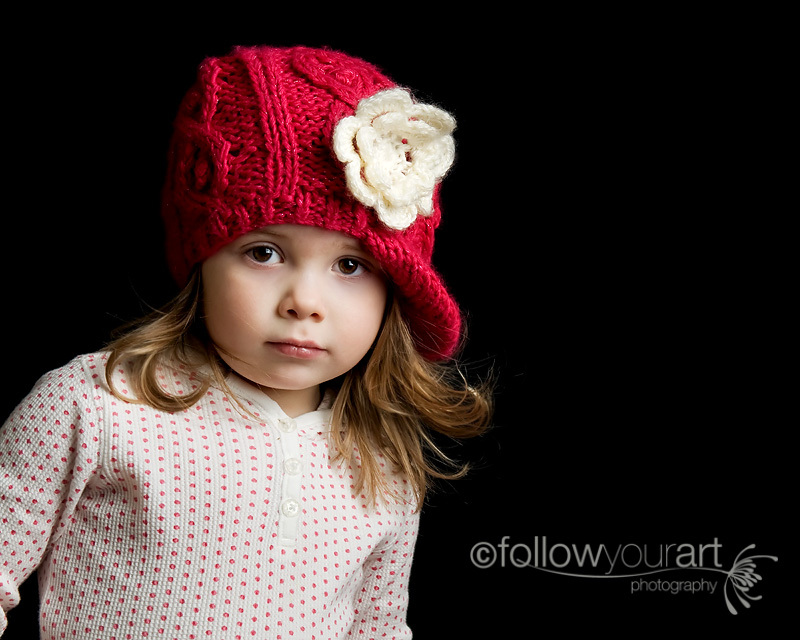 It's been a fun challenge to work with studio light, so so very different from natural light. But I'm always up for a challenge! oh my gosh!!! these rock!! 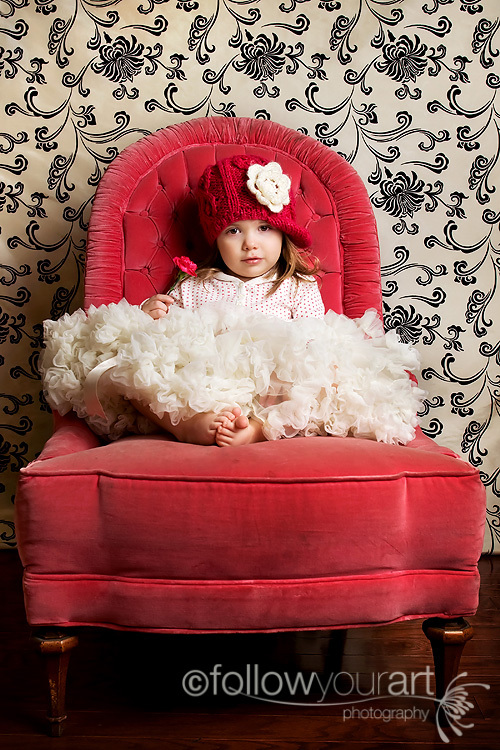 love the background and the chair...and of course our beautiful daughter...great shots! She is so cute, looks a little like her Mommy! Cute backdrop too! What are you talking about? These are perfect!! They are awesome! What a cutie she is! That hat is just darling, and the background and colors, so fun. we missed you!!! those are beautiful btw!! You pulled it off even in 4 minutes! These are adorable! I love your pink chair! Tiffany, you truly are a natural. These look amazing and your baby is a great model (even if only for 4 minutes). Thanks again for today. Oh, Tiffany, these are gorgeous, especially for a four minute shoot. I know about that all too well! My four year old is just now deciding that maybe the camera isn't so bad after two years of hating it! Wow they are just beautiful! oh wow these are just gorgeous, I just love the colors and that chair! These are so pretty! What kind of lighting are you using? Adorable!!! I want to do this kind of a picture next time!!! Thanks for taking the time to stop by and explore my blog! 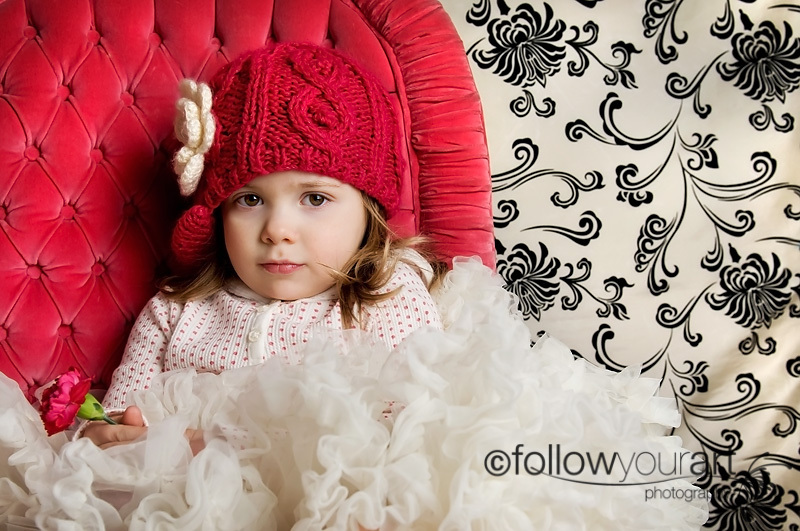 My name is Tiffany Burke, and I am a photographer located in Utah county, Utah. Here you will find posts of my most recent sessions, and up to date information (the links above can help you navigate through past posts, as well as a few other helpful links). I also often share pictures and tidbits of my life. I'm a picture takin, toddler totin, laid back kind of girl! I am a wife to my wonderful husband of 10 years and a mother to my 2 year old miracle baby. Because I am also a full time mom, I only book a limited amount of sessions each month and I do fill up fast. Please email me at tiffany@followyourartphotography.com or call me at 801-414-4388 with any questions you may have and to book your session. PLEASE NOTE THAT I AM NOW BOOKING FOR FALL OF 2009!